Thirty One Gifts is the leading provider of fun, stylish and functional products for women, their families and the home. From signature purses and totes, to storage solutions that help organize your life, there’s something to fit every personality and situation. The name Thirty-One comes from the verses of Proverbs 31 in the Bible that celebrates the busy, hardworking wife, mother, friend, daughter and sister in all of us. Thirty-One recognizes women for who they are and all they do for their families and their communities! 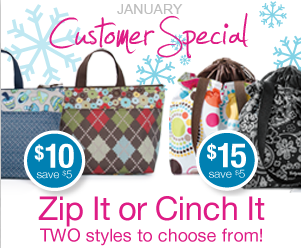 Two of Thirty-One’s Thermal Totes are on sale for $10 and $15 through January 31st. Now is the perfect time to stock up on these for Valentine’s Day, end-of-year teacher gifts or summer travel! Go check ’em out. Enter for a chance to win a $100 gift card to Thirty One Gifts. All you need to do is leave me a comment on this post, after you’ve had a chance to check out the Thirty-One Gifts catalog, and tell me which item you most like and why. Easy peasy! I’ll choose one lucky winner at 9pm (EST) one week from today, on February 4th. I’m in need of a hostess apron. I need something cute to keep my clothes clean while in the kitchen. I love the fitted elite purse skirt! Picnic thermal tote. Looking forward to spring! I have a few Thirty-one items, love the thermal totes! Have had my eye on the black quilted poppy purse for some time now…sigh. I have a thermal tote as well as a matching beach bag that were awesome for our beach vacation last year! Deep, easy to tote, and super cute! I like the soft wallet! I have been aching for their wicker basket to use for toilet paper and necessities near our toilet. I love love love the All-in-one tote! It holds everything I need. It also works as a baby bag, love all the little pockets around it!!! The ruffle cinch sac is super cute and I know my daughter would love to use it for dance class. I love the utility totes! I keep one in my trunk, one by the door; so useful! The Keep it Cool backpack looks like it would really come in handy. The Mini Metro Retro Bag (dark denim) would be awesome for my wife. Thanks for the chance to win! The like the skirt purse with the cute fitted Elite snap cover. This kind of backpack is very useful and easy to carry thank you for sharing this post to us..
medium magazine basket I love it as a toilet paper holder!! And it’s cute. I love the large utility tote! It has so many uses!!!! I think that the market thermal tote is great! I love the skirt purse – so cute and useful bag. And I’m actually needing a new thermal tote, mine is breaking. So cute, I have never heard of this company before! I’m torn between the Retro Metro Weekender or Cinch-It-Up Thermal Tote, however, I’ll probably have to add more to my wish list since everything is so cute. Love the fabrics! I would love the Large utility tote or lunch tote! They would be perfect for traveling! I just got my first 31 products and love them! I would love the fold-go-organizer! Elizabeth Isenberger´s last blog post ..Favorite meal of the day! I love the rolling tote. Perfect for mom’s weekend escape! I need a mommy escape almost as much as I need the rolling tote! I like the Oversized Storage Organizer- I just became a military wife and moved into a new home–gotta get organized!! I am in the process of updating my closet so I would love to get the organizational baskets. In addition, I really like the grey and yellow collection especially the Tote-Ally awesome tote in the awesome blossom pattern. I think that would serve as a great bag for the spring and large enough to also serve as a diaper bag. I am in the process of organizing my closet so the organizing baskets would be great to have. In addition, I love the Tote-Ally awesome tote in the Awesome blossom print. I think that would be a great mutli purpose bag for the spring. It can serve as an everyday bag and a diaper bag in one. I really like this bag very useful and its not heavy to carry..Thank you for sharing this to us..
I’ve been looking at the organizing utility tote for awhile.